We would like to have the same functionality that was implemented for BSERV-2999 in Bitbucket cloud. It would help our workflow to be able to mark reviews complete even if they are not approved. Also, when new commits are pushed to the pull request, we'd like reviewers statuses to be reset so they know they need to re-review. 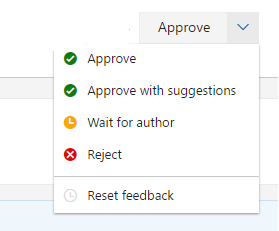 Just to be clear, the "update-PR reset-approvals" / Premium Merge Checks, does this add the Needs Work / Approve buttons to pull requests as is available on Bitbucket server? +1 Really important feature for us. @Tom Davies - No, they are separate features. "Needs work" is not yet available in Bitbucket Cloud, but it's something we'd like to add. Really helpful feature that makes it easier do distinguish between PRs that are still in review and the ones that need attention by the responsible dev. Currently write them in Slack to make sure they're aware of it. Any update on whether this will be implemented or not now that the issue is over a year old? +1 Also a useful feature since sometimes you just want the code reviewed before you go too far, wasting time. With cloud based distributed teams across different continents, this kind of information shared is essential. Please implement in the cloud. Issue #6565 was marked as a duplicate of this issue. +1, this is very essential for managing pull requests and is a feature I miss coming from Bitbucket Server. Issue #15616 was marked as a duplicate of this issue. Does this issue contain: being able to mark a pull request as "Needs work"? This is available in bitbucket server and is good feature to have. Pierre Fransson: I believe that is the core of this feature request, yes (at least the basis for my vote!). Basically transfer the review-statuses that are available in Bitbucket Server to the Cloud-version. +1 would be hugely helpful. Currently we have to comment on the whole pull request to indicate that the review is done. Would be really, really helpful. Please add a [needs work] button. +1 for me too, at the moment it's really difficult to make clear when you are done with a PR. +1 When we have migrated to bitbucket cloud we discovered that this functionality is missing and it broke our PR flow. We are thinking to migrate to GitHub. +1, would make life easier. +1 This is a great idea. I would leave my wife and children in Christmas dinner to check and use this feature in my project. +1 so many +1, when will this feature be implemented (as it is already there in server)? +5 this feature is a must! +1 This is needed for sure. +1 Really important feature. Coming from the on-premise version i hit decline and accidentally closed the PR. I really miss this feature since moving to BB Cloud. Pretty sad this feature isn't here yet :(. Seriously considering other Git platforms due to the lack of progress on this and other needed features. If you could vote instead of adding a new comment, comments send everyone watching the issue an email, and it clogs up this area where updates would be. It would be greatly appreciated, thanks! Issue #17861 was marked as a duplicate of this issue. Any chance of an update on this one and whether it will be implemented? Raised in 2016. We are in 2019. 405 votes. Still no resolution. Any plans to implement this? WE NEED THIS FEATURE !!! Any news on this? The other major platforms already offer this feature! Can someone from Atlassian please let the community know when this essential feature can be introduced? Flipping PRs between authors and reviewers is so essential to the correct code review process that it's a huge bummer we don't have it in Bitbucket Cloud yet.